Now days knowing a PAN Card details online is very easy and convenience task for every citizen. You have to go from step by step procedure. Suppose in a case of knowing your PAN Card, if you forgot your Permanent Account Number, Then it is not a big deal because the government of India provided a very good facility through which you will Know Your Pan Card with Date of Birth and Name very easily. PAN stands for Permanent Account Number. This plastic card like a unique identity proof day by day becoming an essential document for commercial transactions. If you look physically it is a plastic laminated card carrying 10 digit alphanumeric code-number issued to each person individually by Income Tax Department of India. This PAN is valid across the country and remains unaffected by any change of address within country India. Due to its valuable importance large number of people are applying for it. It is a mandatory identity document required for financial transactions including receiving taxable salary or taxable professional fees. If “there are multiple records found for this query. Please provide additional information”. 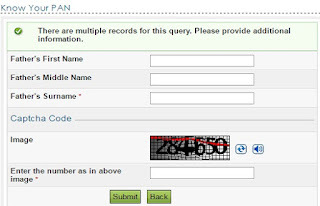 Then enter your Father’s First Name, Father’s Middle Name and Father’s Surname (Mandatory) and enter captcha and click on submit. After this, a new page will open in which you can verify your PAN Details. In the case of any error, refresh the link and fill all the details again.